gprMax (http://www.gprmax.com) is free software that simulates electromagnetic wave propagation. It solves Maxwell’s equations in 3D using the Finite-Difference Time-Domain (FDTD) method. gprMax was designed for modelling Ground Penetrating Radar (GPR) but can also be used to model electromagnetic wave propagation for many other applications. gprMax is released under the GNU General Public License v3 or higher (http://www.gnu.org/copyleft/gpl.html). gprMax is written in Python 3 (https://www.python.org) and includes performance-critical parts written in Cython/OpenMP (http://cython.org). conda_env.yml is a configuration file for Anaconda (Miniconda) that sets up a Python environment with all the required Python packages for gprMax. docs contains source files for the User Guide. The User Guide is written using reStructuredText (http://docutils.sourceforge.net/rst.html) markup, and is built using Sphinx (http://sphinx-doc.org) and Read the Docs (https://readthedocs.org). LICENSE contains information on the GNU General Public License v3 or higher (http://www.gnu.org/copyleft/gpl.html). README.rst contains getting started information on installation, usage, and new features/changes. setup.py is used to compile the Cython extension modules. tests is a sub-package which contains test modules and input files. tools is a sub-package which contains scripts to assist with viewing and post-processing output from models. user_libs is a sub-package where useful modules contributed by users are stored. user_models is a sub-package where useful input files contributed by users are stored. You should use the following guidance to install gprMax if you are an end-user (i.e. you don’t intend to develop or contribute to the software). Developers (or those intending to use gprMax in a HPC environment) should follow the Installation for developers section (http://docs.gprmax.com/en/latest/includereadme.html#installation-for-developers). Click on Releases from the top header and choose the release you want (latest is at the top). Download zip files of the source code and binary extensions for your platform, windows-32bit for 32-bit or windows-64bit for 64-bit versions of Microsoft Windows, linux-64bit for 64-bit versions of Linux, or macosx-64bit for 64-bit versions of Mac OS X. Expand both zip files and copy the contents of the windows-32bit, windows-64bit, linux-64bit or macosx-64bit directory into the gprMax-v.X.Y.Z/gprMax directory. We recommend using Miniconda to install Python and the required Python packages for gprMax in a self-contained Python environment. Miniconda is a mini version of Anaconda which is a completely free Python distribution (including for commercial use and redistribution). It includes more than 300 of the most popular Python packages for science, math, engineering, and data analysis. Install the Python 3.5 version of Miniconda for your platform (http://conda.pydata.org/miniconda.html). Open a Terminal (Linux/Mac OS X) or Command Prompt (Windows) and navigate into the top-level gprMax directory. Activate the new environment source activate gprMax (Linux/Mac OS X) or activate gprMax (Windows). When you are finished using gprMax the Miniconda environment can be deactivated using source deactivate (Linux/Mac OS X) or deactivate (Windows). If you want to install Python and the required Python packages manually, i.e. without using Anaconda/Miniconda, look in the conda_env.yml file for a list of the requirements. Install the Microsoft Visual Studio 2015 C++ Redistributable (vc_redist.x86.exe for 32-bit or vc_redist.x64.exe for 64-bit) from https://www.microsoft.com/en-us/download/details.aspx?id=48145. You are now ready to proceed to running gprMax. Your results should like those from the A-scan from a metal cylinder example in introductory/basic 2D models section (http://docs.gprmax.com/en/latest/examples_simple_2D.html#view-the-results). --geometry-only will build a model and produce any geometry views but will not run the simulation. This option is useful for checking the geometry of the model is correct. -n is used along with a integer number to specify the number of times to run the input file. This option can be used to run a series of models, e.g. to create a B-scan that uses an antenna model. -mpi is a flag to turn on Message Passing Interface (MPI) task farm functionality. This option is most usefully combined with -n to allow individual models to be farmed out using MPI. For further details see the Parallel performance section (http://docs.gprmax.com/en/latest/openmp_mpi.html#parallelism-openmp-mpi). --write-python will write an input file after any Python code blocks in the original input file have been processed. -h or --help can be used to get help on command line options. Install the Python 3.5 version of Miniconda for your platform (http://conda.pydata.org/miniconda.html). Follow the instructions (http://conda.pydata.org/docs/install/quick.html) if you are having any trouble. Activate the new environment (Linux/Mac OS X) source activate gprMax or (Windows) activate gprMax. gcc (https://gcc.gnu.org) should be already installed, so no action is required. gcc (https://gcc.gnu.org) is easily installed using the Homebrew package manager (http://brew.sh) brew install gcc --without-multilib. Installations of Xcode on Mac OS X come with the LLVM (clang) compiler, but it does not currently support OpenMP, so you must install gcc. Download and install Microsoft Visual Studio 2015 Community (https://www.visualstudio.com/downloads/download-visual-studio-vs), which is free. Do a custom install and make sure ‘Programming languages|Visual C++|Common Tools for Visual C++ 2015’ is selected, no other options are required. Fig. 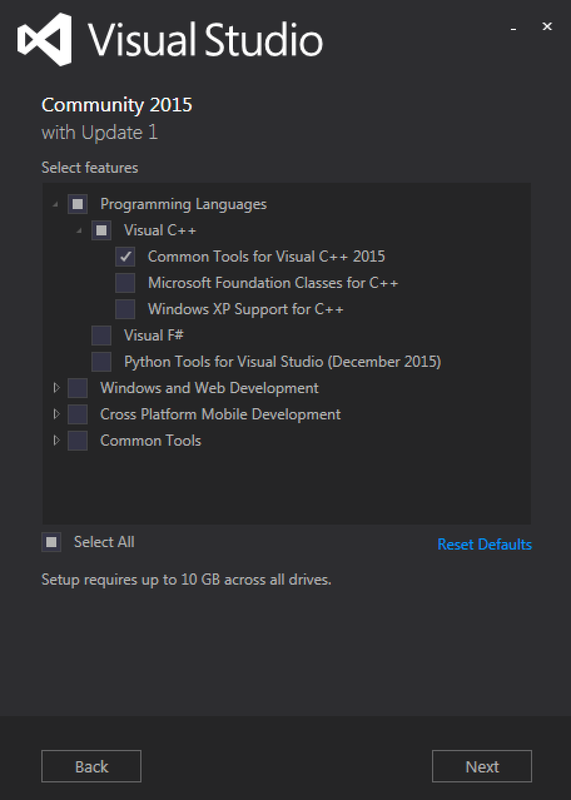 1 Screenshot of Microsoft Visual Studio 2015 Community custom install settings. Compile the Cython extension modules using: python setup.py build_ext --inplace. You should see a set of .c source files and a set of .so (Linux/Mac OS X) or .pyd (Windows) compiled module files inside the gprMax directory. If you want to remove/clean Cython generated files, e.g. before rebuilding the Cython extensions, you can use python setup.py cleanall.